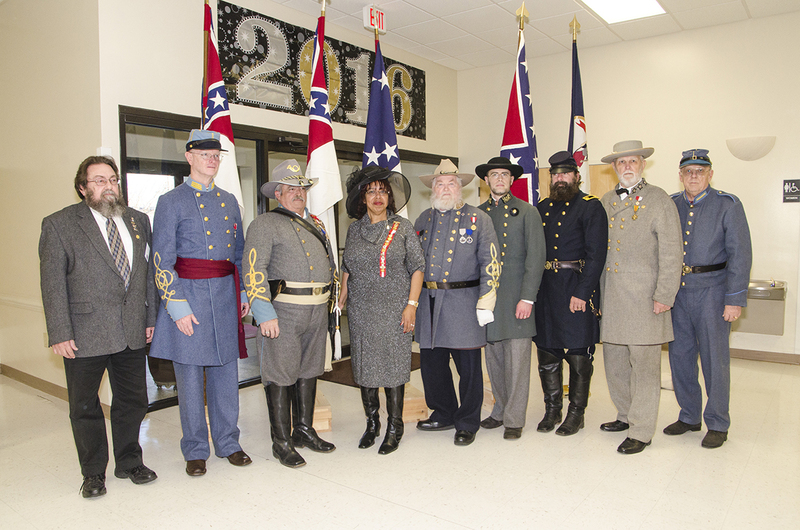 On January 10th, 2016, there was a special guest at the Annual Culpeper UDC Chapter 73 Lee-Jackson Commemoration in addition to the Award winners. 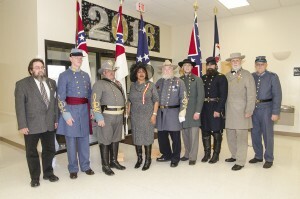 Ms. Teresa Roane, Corresponding Secretary VA Division United Daughters of the Confederacy provided the program, “Minorities in the Confederate Military”. Frederick Douglass vouched that there were many colored men in the Confederate Army, with muskets and bullets, ready to shoot down loyal troops. Ms. Roane provided documented evidence that there really were. In the photo from left to right: Virginia Society Commander Joe Wright, Jr.; Chapter 258 Adjutant Vic Cole; Chapter 258 Commander Chris Ezelle; Ms. Teresa Roane special guest speaker, Chapter 258 Treasurer Charlie A. Embrey, Sr.; Chapter 258 Chaplain Robert Hester, Stafford Light Artillery Greg Randall, George “Tex” Wells, and Chapter 258 Member John Johnston.